There are CONTACT exhibitions everywhere in Toronto this month; a coffee shop around the corner from me on Dundas West, the local organic supermarket even! Hard to get a good look at them through the vegetable misters, but they are there. Is the essential character of a city reflected in its transportation systems or do the systems help to create the character? Think of the glamour of Montreal’s metro; its bold graphic styling and silently approaching trains, or the romance of New York’s subway, permanently embedded like its famous black and white, art deco tiles. 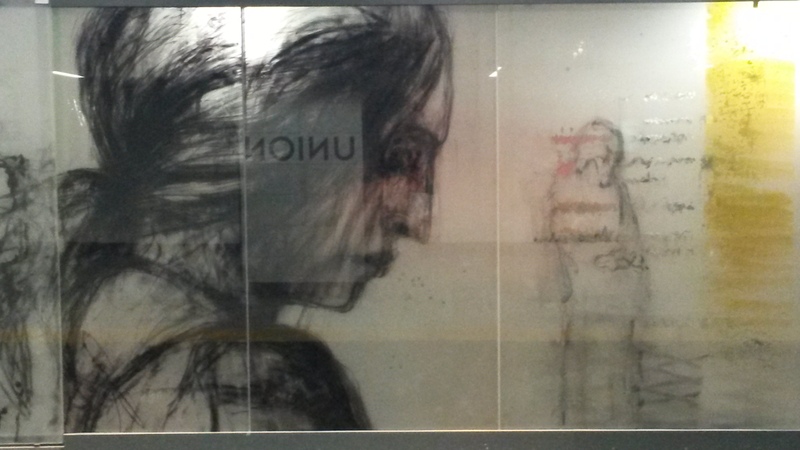 Relatively, Toronto’s underground transportation has seemed somewhat mundane, workaday and all about function. Chris Shepherd gets at the heart of the form and function connection in his exhibition at Bau Xi Photo. 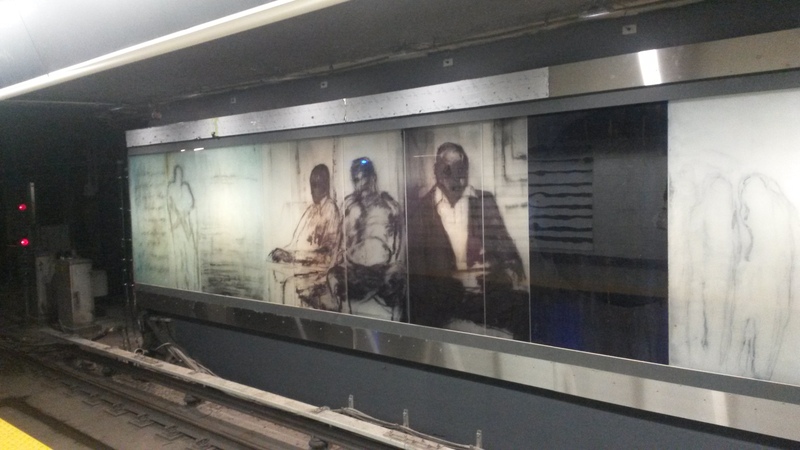 (I am actually the owner of some subway shots Chris Shepherd and I think it is because of looking at these photographs that I began to appreciate the aesthetic of Toronto’s subway.) Sadly, it is not glamour or romance that is at the core of Toronto; it is work. And the Toronto subway is in total harmony. The photographs of Chris Shepherd show us the modest pathways to our daily grind and reveal their perfection. The colours were chosen to discourage rowdy behaviour and loitering rather than for aesthetic reasons. Consequently, they have that institutional quality of hospital or penitentiary walls. 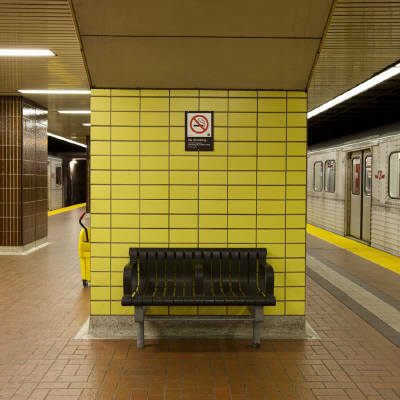 For many years, Torontonians grumbled that their subway stations looked like public washrooms. But now, decades later, the remaining designs have become Modernist classics. 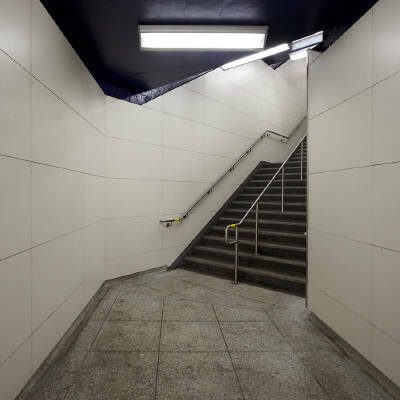 There has been a recent flurry of TTC projects to improve and concurrently embellish the existing underground system. It’s exciting to see a little civic preening going on in this city so focused on dogged achievement. 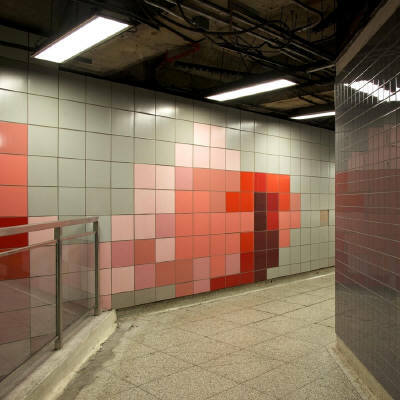 At Dufferin Station, Winnipeg artists Eduardo Aquino and Karen Shaski (of spmb) add blooms of pure colour, and big pixilated images to transform one of the most heavily used and rundown station of the Bloor line. Chris Shepherd documents this unrestrained use of colour so well. We can only hope it does not lead to loitering or rowdiness. And finally the hoardings have come down at Union Station. Big, messy, sketchbook style line drawings by Stuart Reid are revealed. 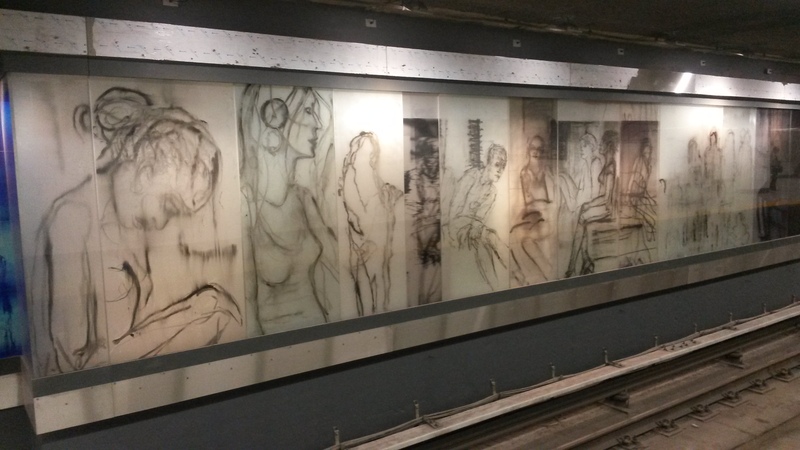 The drawings, depicting TTC riders, have been blown up and transposed onto glass panels. They are fresh, unexpected, thoughtful, sensitive and kind of a shock relative to the relentless TTC grids and tiles. My current work address is near the Ferry terminal at the bottom of Bay Street. Wandering around the area at lunch time gives me the feeling the plastic wrap is coming off. Everything is shiny, clean and has that new car smell. 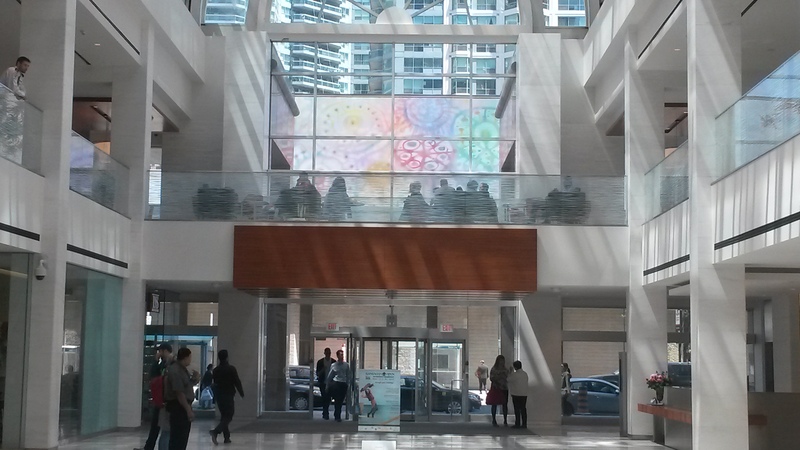 Across the street from me, draping the exterior of the Westin Harbour Castle Conference Center at 11 Bay Street is a public installation (also part of the Scotiabank CONTACT Photography Festival) titled Best Beach by Sarah Anne Johnson. 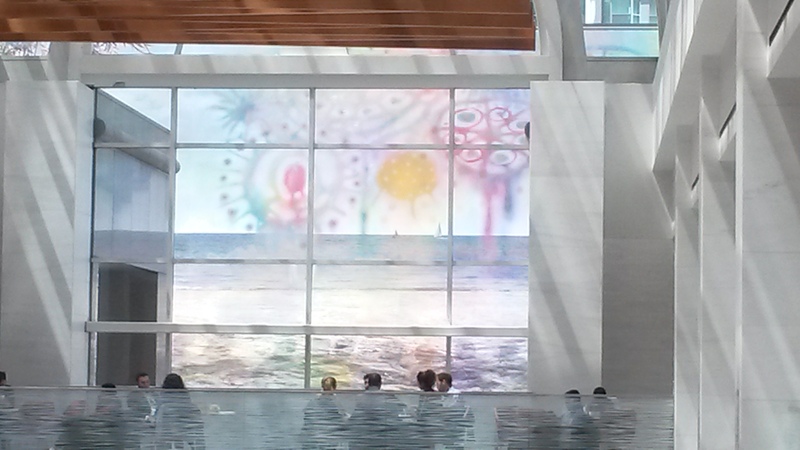 The piece is particularly stunning when seen from within the Waterpark food court at mid-day. At that time the whole place is flooded with light and Sarah Anne Johnson’s piece looms over the oblivious diners, glowing and shimmering in the daylight. 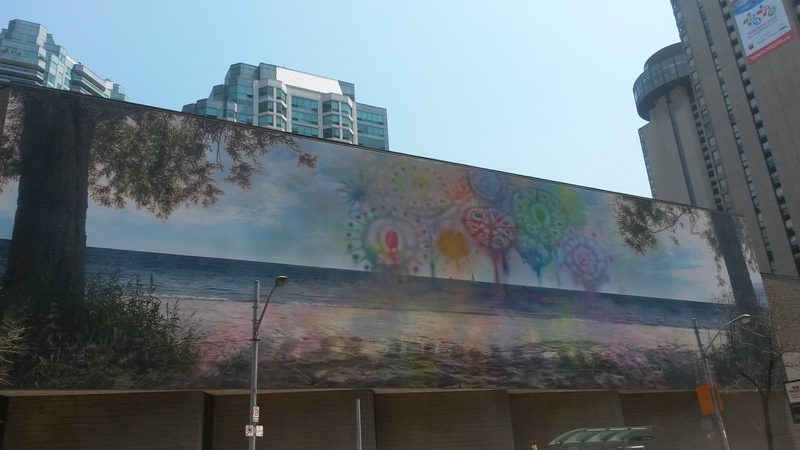 It is a huge photograph and it sweeps across the entire end of the food court’s massive plane of windows like some giant playground graffiti, messy, dripping, flourescent and joyful. Why Jan Groover is included I do not know? She was born in 1943 and became well known in the 1970s for close up, vaguely feminist, domestic interiors. 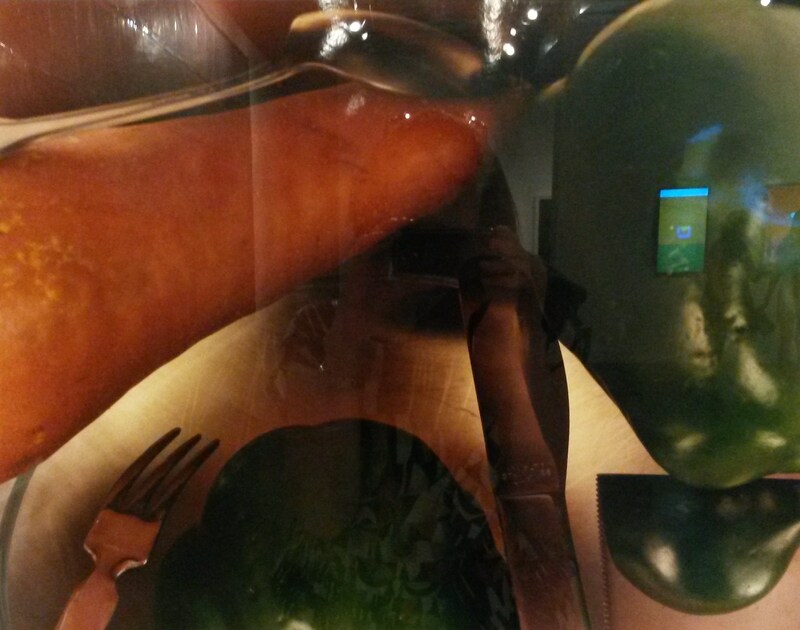 Maybe its because they are truly painterly and reminiscent of a Braque still life in purples, greens and reds? In any case I appreciated seeing these beautiful photos. 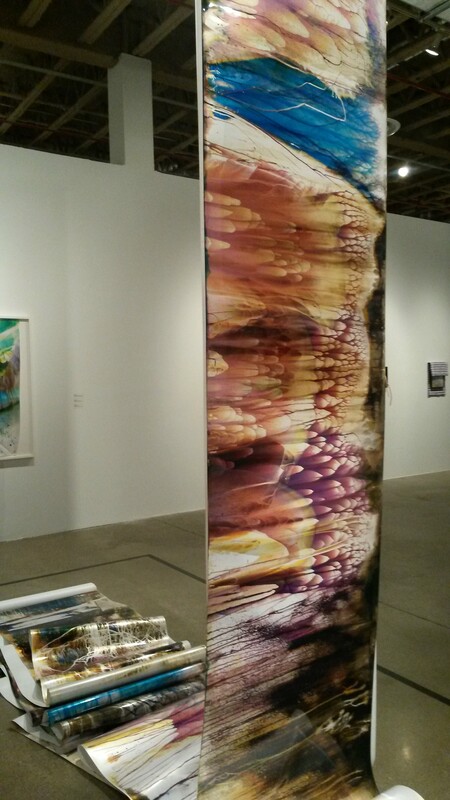 Painterly too are the photos by James Welling. 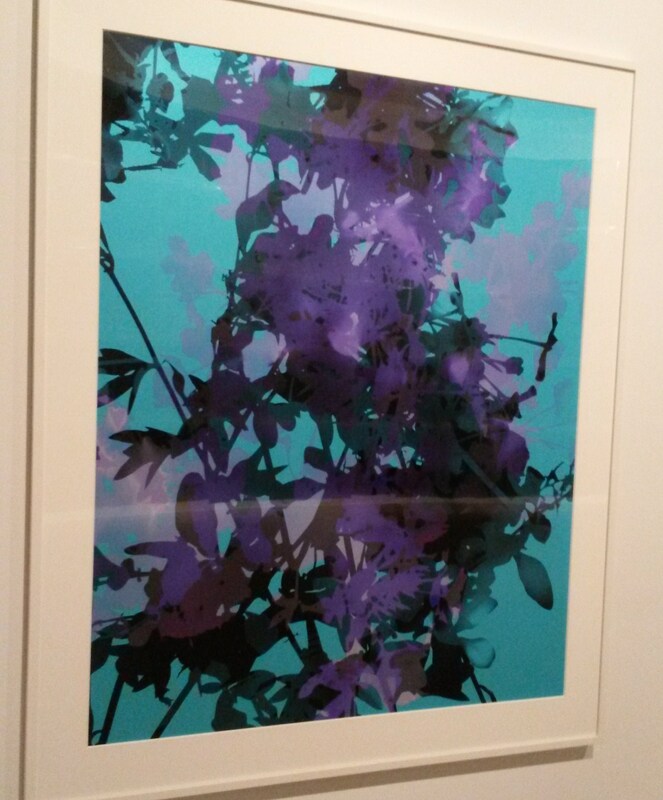 It’s interesting that James Welling has worked for Brioni (the Italian fashion conglomerate) because these prints resemble nothing so much as pretty dress fabric. Works by Ryan Foerster are more in line with the stated intentions of the show and truly take photography into another realm. Eschewing the tradition of pristine craftsmanship in a dust free darkroom, Ryan Foerester uses mangled photo plates, chance and accidents of light, dirt and debris to create wonderfully expressionist pieces with a particular Petri-dish gore appeal that reads as post apocalyptic. 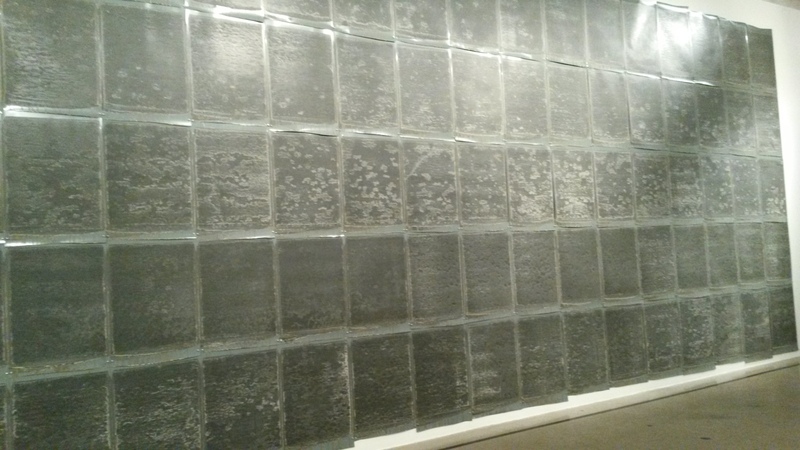 Ellen Carey’s Mourning Wall is composed of spent Polaroid plates. They have a dreary, grey, funerary look and are arranged in the finest tradition of minimalist sculpture. This piece made me think about the brief flowering of unique technologies. (How exciting Polaroid once was! Why did I throw my Commodore 64 in the trash?!) Ellen Carey extends the metaphor of obsolescence, death and decay with the Rust Belt aesthetic of this work. 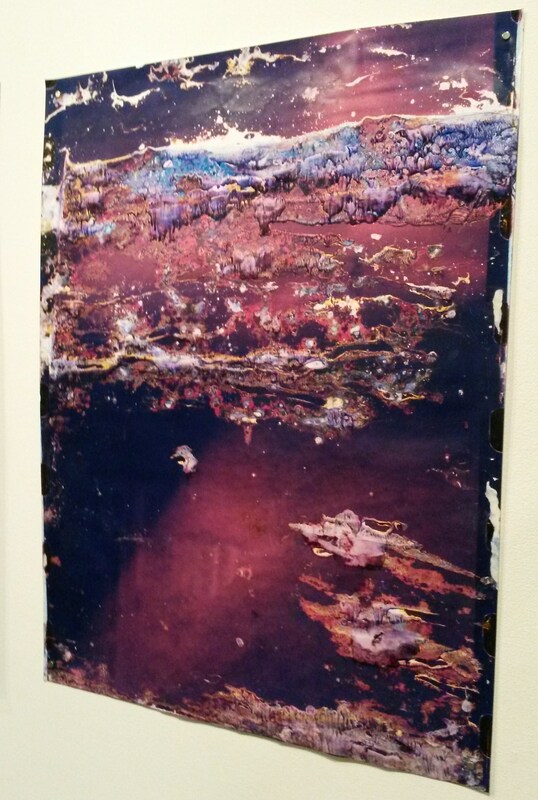 Slick reams of photo paper tumble in heaps; snapshots sprout cables or have little blanket covers attached; but more typically, in this show, photographs take on a more painterly look, moving away from documentation, the traditional province of photography, and closer to objecthood, and marketability.